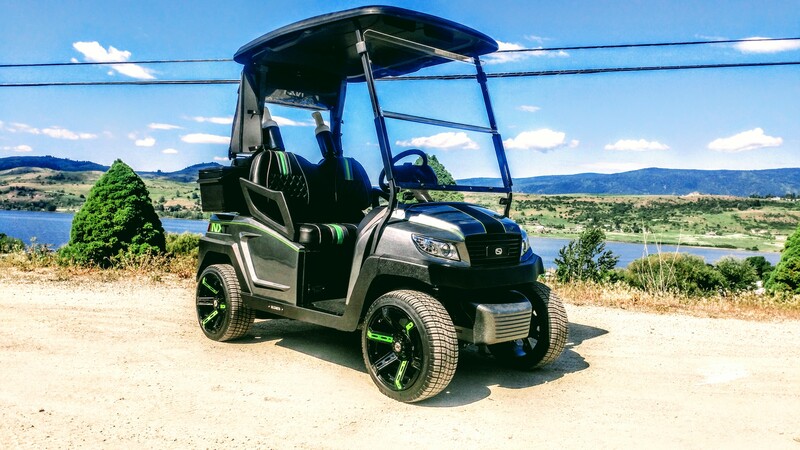 Here is a very cool NXT-G2, it’s our first customer to lift a G2 and our whole team is super stoked about building a lifted golf cart that will actually be used as a golf cart! Of course if you have a customer bold enough to lift their golf cart you better believe they are going to make it bold! Get under this one! Here is our customers truck, this is what he gave us to work with and then he gave us some room run! After having the identical paint mixed up our paint department got to it in the booth! Just the right amount of orange! The wheels turned out crazy good, you have to admit this beast stance makes you smile! With the body dry it was time to install the rear panels! Look how sick this is coming along! A rear view shows you the super cool stance on this NXT-G2 and a slight peak into the power house motor compartment! Tasteful yet bold…our upholstery department nailed this look! Yup we do custom! The orange stitching in our customers embroidery is bang on!